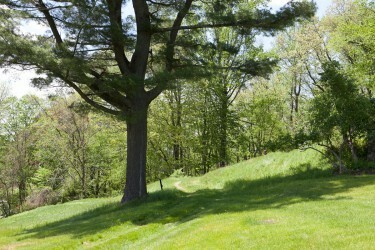 The original carriage drive entered the estate from the Post Road, one mile north of the current Homestead driveway. In the mid-19th century, an avenue (allée) of beech trees was planted by John Jay II along the drive below the house. These grand trees still stand at the bottom of the hill along a restored section of the drive. To the right of the allée, along the hillside below the house, the Jays planted a pear orchard which was productive for more than 100 years. The carriage drive brought family and visitors up a winding course through the allée, pear orchard, and up the rise to the carriage circle in front of the house presenting a dramatic first view. The enormous trees here lined an estate drive, creating a spectacular canopy for the carriages that brought the Jays and their guests to the main house. The land just beyond the allée was sold by the family in the mid-20th century; it is now privately owned.